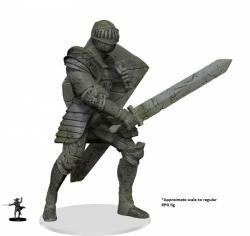 WizKids has unveiled a walking contradiction with the Walking Statue of Waterdeep � The Honorable Knight premium figure for its D&D Icons of the Realms Miniatures in August. One of eight massive stone guardian constructs of the city of Waterdeep, The Honorable Knight is at the command of the Blackstaff to be called upon to defend the Crown of the North from invading ethereal creatures. The 57 � 3� tall statue is represented by an approximately 11� pre-painted miniature.